Gretchen Hayes of Neptune recently returned from a deployment in Afghanistan. 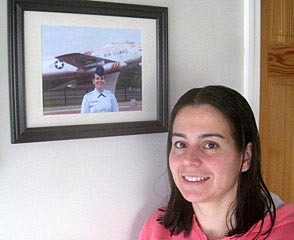 She is a member of the Air Guard and is a flight nurse with the rank of first lieutenant. While a student at Monmouth Regional High School in Tinton Falls, Gretchen Hayes had to figure a way to pay for a college education. She chose the healthcare field – first getting a bachelor’s degree in biology from Richard Stockton College of New Jersey, then an associate’s degree in nursing from Brookdale Community College and, finally, a bachelor’s degree in nursing from St. Peter’s University. “I always liked to help people, care for people,” Hayes said. Along the way, she was a volunteer with Tinton Falls Emergency Medical Services South. “I like helping my community,” she said. Today, Hayes, a 13-year member of the Air Guard, is a flight nurse with the rank of first lieutenant in the 142nd Aeromedical Evacuation Squadron out of Delaware. In January, she returned from a three-month deployment to Afghanistan. There, the squadron’s job was to transport coalition forces and civilians with war and everyday injuries, along with other medical issues, from base to base within the country. But she did two outside flights, one to Germany and one to Qatar. She would have done a full four months in Afghanistan, but she returned home early because of her mother-in-law’s death. She married Susan Peters, 46, in May. Because of her deployment, she missed Thanksgiving, Christmas and New Year’s at home. Had her deployment went the full four months, she was scheduled to come home Feb. 14, Valentines’ Day. Hayes has been in the 142nd for three years. Her prior 10 years was with the 108th Air Refueling wing at Joint Base McGuire-Dix-Lakehurst. She had done a two-month deployment in Iraq with the 108th in 2008. For the time being, she is back at work as a registered nurse in the trauma-surgical intensive care unit at Jersey Shore University Medical Center in Neptune. There, she also sees severe injuries – caused by gunshot, motor vehicle accident, falls and so on. “Life is what you make of it,” Hayes said. “You have to live life to the fullest. Posted in Shore Communities and tagged Joe Sapia, Neptune.